Muse Gallery will be hosting a joint Pop Up Show @ Muse Gallery Hilton Head- February 15-28, 2018, featuring wall hanging and free standing sculptural work by artists Debra Fritts, Signe Stuart, Sue Cavanaugh and Char Norman. Cavanaugh and Norman will be in attendance for the show to meet and discuss the work. Opening Reception will be held on Friday February 16th from 5-8 pm and a Private Brunch with the artists will be held on Saturday February 17th from 11-1 pm. We hope you can join us! "I am interested in gathering: assembling, collecting, hoarding . . . and the process of taking needle to cloth and creating folds. The stitching has grown out of the ancient art of patterning cloth for kimono, and most names reference the original stitches, even though I’ve transformed those stitches over time. The “Ori-Kume” series combines ori-nui, stitches done on the fold with mokume running stitches. “Ori-maki-kume” describes a combination of mokume running stitches and ori-maki-nui stitches, an original hybrid stitch that creates a density I’ve grown to love...Cloth challenges notions of traditional art. At the same time, fabric is universally accessible and comforting. I’m particularly attracted to dichotomies, to yin/yang, attraction/repulsion, black/white, and the vastness of the gray area in between. All my work begins with a drawing, a plan. But the surprises that develop along the way delight and challenge me. These surprises inform future works." Cavanaugh works by hand with cloth, cord, dye, paint and occasionally wood and wire. She does this by hand and without assistants. Her work has been seen in national and international exhibits at the Columbus Museum of Art, Oceanside Museum of Art, Springfield Museum of Art (Ohio), Ross Museum of Art, Johnson-Humrickhouse Museum of Art, Ohio Craft Museum and Zanesville Museum of Art. Awards include Best of Show, Shibori Cut Loose exhibit, Textile Center, Minneapolis; Ruth Lantz Fiber Award; Janet Long Memorial Award for Excellence in Fiber; Ohio Arts Council Professional Award; and the Lynn Goodwin Borgman Award for Surface Design. In 2012 she was selected by the Greater Columbus Arts Council and the Free State of Saxony for an artist residency in Dresden, Germany. She worked in a studio at Geh8 Kunstraum und Ateliers for 80 days culminating in a two-person exhibit with Rotterdam painter Marielle Buitendijk. Cavanaugh's work is in collections of the Hilton Columbus Downtown and the Ohio Arts Council and private collections in Ohio, New Mexico, California, New York, Chattanooga, and West Seattle. She is represented by Muse Gallery, Columbus, Ohio, and gráficas gallery, Nantucket, Massachusetts. She lives in downtown Columbus, Ohio, and has a studio in the 400 West Rich artist community. "As a child, I had dirt under my fingernails and spent hours playing in the mud. Today I continue to allow the earth to feed me information for my art. Working intuitively from pounds of wet red clay, forms appear and stories develop. I may be questioning an occurrence or celebrating a relationship or just being aware of the precious environment. The search continues until I reach the core: the spiritual level of the sculpture. Then the work can speak. At the present, I am exploring new territory in Abiquiu, New Mexico while embracing my southern heritage. Often symbols are used in the work such as the color red or three dots to honor my mother or the raven as a symbol for my new life in the west. I am “touching ground”, getting to the basics, listening and learning. Each sculpture is hand built, using thick coils, and fired three to five times depending on the color and surface I am trying to achieve. I approach the color on the clay as a painter. My palette is a combination of oxides, slips, underglazes, and glazes. The form of the piece informs the type of surface treatment." Debra Fritts considers herself a narrative artist allowing her work to tell stories of daily life and events. Her works are influenced by her time in New Mexico exploring the west while embracing her southern heritage. Debra has been published in books such as: Artists Homes and Studios, Ashley Rooney, Schiffer Publishing. Contemporary Ceramics, E. Cooper, Ceramic Figures, Lark Books, and 500 Figures, Leslie Ferrin, Lark Books. Museum Collections include: Fuller Museum, Brockton, Massachusetts and Georgia Southern University, Saunders Georgia Artist Museum. Professional and Teaching Experience includes Director of Art Center West, Roswell, Georgia 1995-2011, Beatrice Wood Center, workshop, Ojai, California, and Surface National Clay Conference, San Diego, California. "The work I am engaged in stems from a deep-rooted connection to natural objects and environmental issues while examining the relationship between man and nature. Reverential attitudes and nurturing acts contrast with the destruction of nature. The pod forms I use are both a type of shroud for natural relics and a womb or cradle for rebirth. This dichotomy of ideas is further expressed by the mending of natural objects through the violent act of stitching and fastening parts together. I find it fascinating and somewhat meditative to achieve a whole through the slow and gradual building up of small elements. Weaving is based on this principle and my drawing technique mirrors this idea as I layer graphite and colored pencil to create the image. Even the fibers in my handmade paper echo the idea of small units building to become a whole. Manipulation of materials and the use of traditional techniques in surprising or nontraditional ways are challenging and engage me in problem solving. The engineering necessary to create a three-dimensional piece on a loom intended for two-dimensional processes and the use of soft materials to form substantial objects is of particular interest. As I continue to explore natural relics as icons, votives, or objects of reverence, I hope to engage the viewer in a way of seeing that may lead to a respect and appreciation for the environment. Future plans call for returning my sculptures to the location from where the natural object was taken. In this way I give back and let the elements take their natural course in the cycle of life." 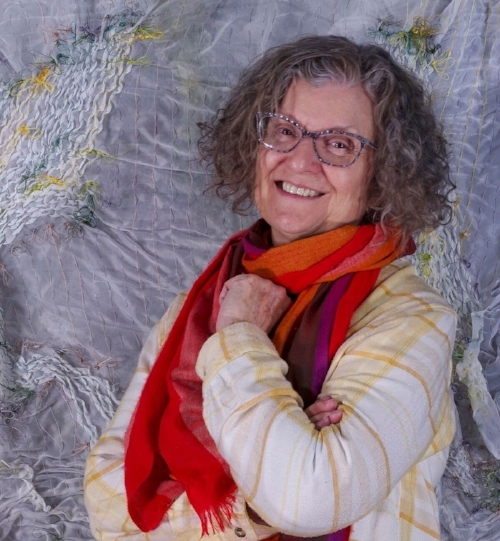 Char Norman is an accomplished fiber artist specializing in papermaking and fiber sculpture. She received a Master of Fine Art from Claremont Graduate University and a Bachelor of Art from Scripps College. She has lectured and exhibited extensively both nationally and internationally. She has developed and conducted workshops for all ages, worked as a consultant to area schools and community arts organizations, held the positions of Associate Provost and Dean of Faculty at Columbus College of Art & Design and has recently returned to the studio as a full time professional artist. "Observations and questions about mysteries of the universe, life and consciousness are sources of visual ideas for my paintings and constructions. Making these works is an ongoing process of experimentation and negotiation between ideas and materials. I want my artworks to resonate with viewers and move them toward seeing this is that: everything as a consequence of endless shape-shifting, combining and recombining." Signe Stuart's professional history spans over fifty years, beginning in the early 1960's. Her approach to art making relies on experimentation with painting materials and forms, often breaking from the standard rectangle and concepts of framing. Stuart has lived and worked in diverse regions of the United States: East Coast, Pacific Northwest, Northern Plains, and Southwest: residing now in Santa Fe, New Mexico. Since 1972, Signe Stuart has had 18 solo museum exhibitions including those at the Sheldon Art Museum, Lincoln, NE; North Dakota Museum of Art, Grand Forks, ND; American Swedish Institute, Minneapolis, MN; South Dakota Art Museum, Brookings, SD and the Roswell Museum and Art Center, Roswell, NM. Her work has also been included in many museum group exhibitions, among them the Joslyn Art Museum, Omaha, NE; the New Mexico Museum of Art, Santa Fe, NM; Burchfield Penny Art Center, Buffalo, NY and the Minneapolis Institute of Arts, Minneapolis, MN. Public Collections include: American Swedish Institute, Minneapolis, MN, Benton Museum of Art, Storrs, CT, Blanden Art Museum, Fort Dodge, IA, Boise Art Museum, Boise, ID, Cedar Rapids Puiblic Library, Cedar Rapids, IA, Dahl Art Center, Rapid City, SD, Grinnell College, Grinnell, IA, Joslyn Art Museum, Omaha, NE, Miami Airport, Miami, FL, New Mexico Museum of Art, Santa Fe, NM, New Mexico State Capitol Art Foundation, Santa Fe, NM, North Dakota Museum of Art, Grand Forks, ND, Plains Art Museum, Fargo, ND, Roswell Museum and Art Center, Roswell, NM, Salt Lake City Public Library, Salt Lake City, UT, Schnitzer Museum of Art, Eugene, OR, Sheldon Museum of Art, Lincoln, NE, Sioux Falls Airport, Sioux Falls, SD, South Dakota Art Museum, Brookings, SD, Southwest Minnnesota State University Museum, Marshall, MN, Tacoma Art Museum, Tacoma, WA, University of New Mexico Museum of Art, Albuquerque, NM, Utah Museum of Fine Arts, Salt Lake City, UT, Washington Pavilion, Sioux Falls, SD.